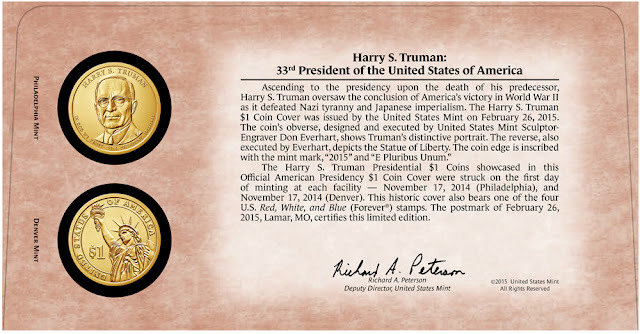 The 2015 Harry S. Truman Presidential Dollar represented the first release of the ninth year of release for the Presidential $1 Coin Program. Overall this represented the thirty-third release of the program. 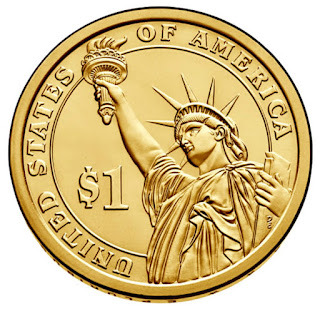 In keeping with the Treasury Department decision made at the end of 2011, the golden colored $1 coins were no longer produced for release into general circulation. Rather the coins were only distributed within numismatic products offered by the United States Mint. Prior to becoming President, Harry S. Truman was elected county court judge, served two terms in the U.S. Senate, and was elected vice president for the fourth term of Franklin D. Roosevelt’s presidency. After Roosevelt’s sudden death, he succeeded the presidency and would also be elected for a second term. 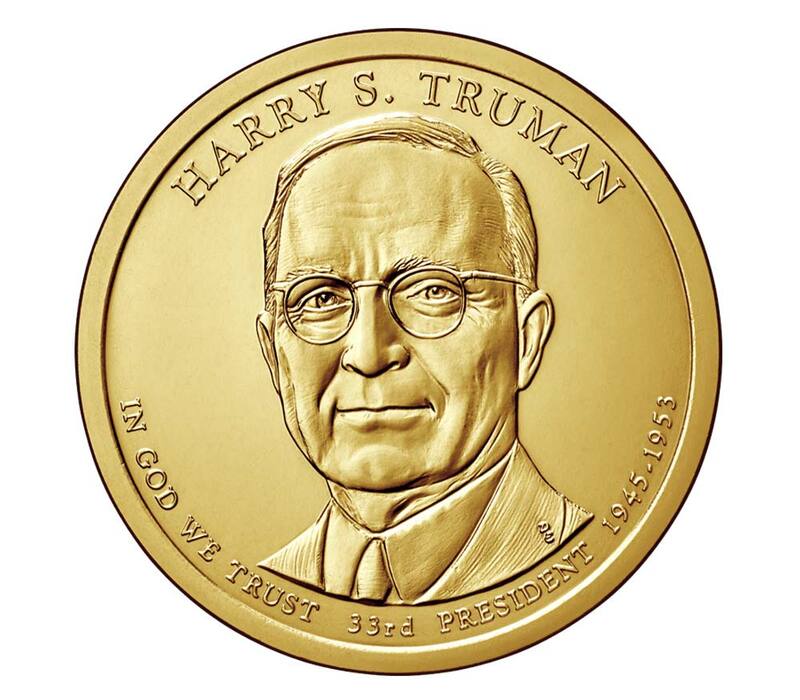 The obverse design of the Harry S. Truman Dollar features a front-facing portrait of the former President, designed and sculpted by Don Everhart. The inscriptions include the President’s name, the motto “In God We Trust”, “33rd President”, and the dates served “1945-1953″. The reverse, which was also designed and engraved by Don Everhart, features an image of the Statue of Liberty with inscriptions “United States of America” and “$1″. The date, mint mark, and motto “E Pluribus Unum” appear as incused edge lettering. On February 5, 2015, the United States Mint started accepting orders for circulating quality examples of the coins packaged in 25-coin rolls, 100-coin bags, and 250-coin boxes. As in prior years, these products were available containing coins from either the Philadelphia or Denver Mint facilities and priced at a slight premium to face value. 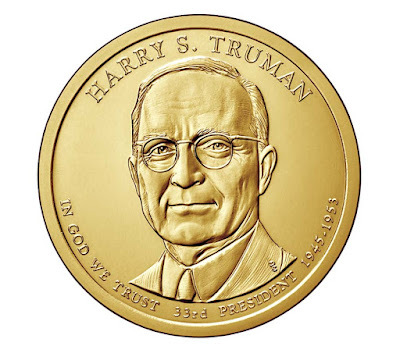 Throughout the year, the Harry S. Truman Presidential Dollars will also be incorporated into other numismatic products. 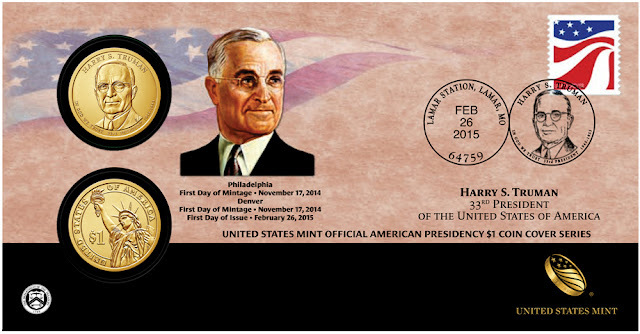 A proof version struck at the San Francisco Mint will be included in the 2015 Proof Set, 2015 Silver Proof Set, and 2015 Presidential $1 Coin Proof Set. 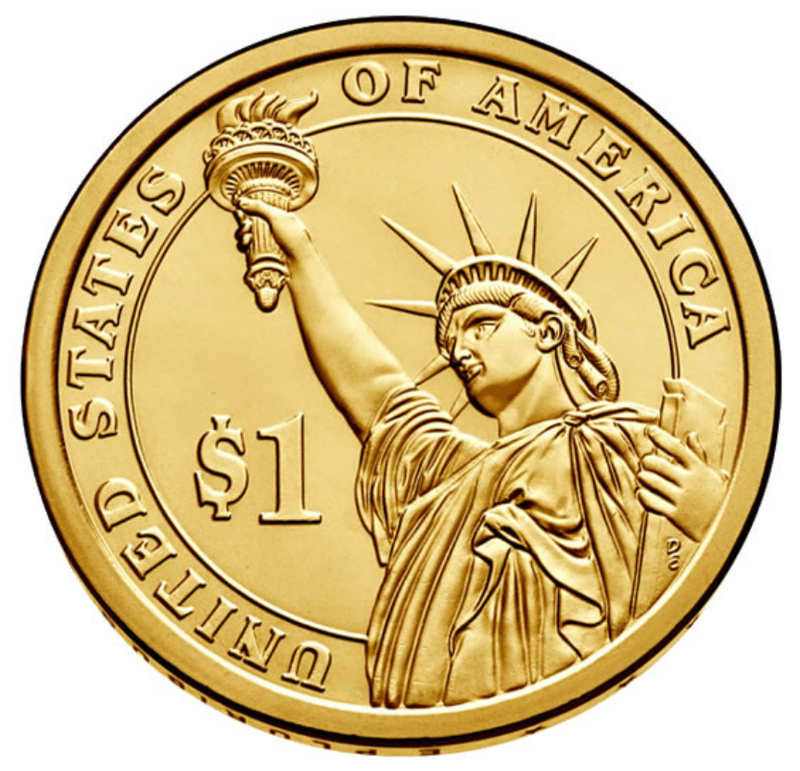 Uncirculated versions will be included within the 2015 Uncirculated Coin Set and a 2015 Presidential $1 Uncirculated Coin Set. Circulating quality versions will be available within a First Day Coin Cover and a four coin Presidential Circulating $1 Coin Set. Finally, a Harry S. Truman Coin and Chronicles Set is scheduled for release late in the year. Harry S. Truman (May 8, 1884 – December 26, 1972) was the 33rd President of the United States (1945–1953), an American politician of the Democratic Party. He served as a United States Senator from Missouri (1935–1945) and briefly as Vice President (1945) before he succeeded to the presidency on April 12, 1945 upon the death of Franklin D. Roosevelt. He was president during the final months of World War II, making the decision to drop the atomic bomb on Hiroshima and Nagasaki. Truman was elected in his own right in 1948. He presided over an uncertain domestic scene as America sought its path after the war, and tensions with the Soviet Union increased, marking the start of the Cold War. Truman was born in Lamar, Missouri and spent most of his youth on his family's farm near Independence. In the last months of World War I, he served in combat in France as an artillery officer with his National Guard unit. After the war, he briefly owned a haberdashery in Kansas City, Missouri, and joined the Democratic Party and the political machine of Tom Pendergast. Truman was first elected to public office as a county official in 1926, and then as a U.S. Senator in 1935. He gained national prominence as chairman of the Truman Committee, formed in March 1941, which exposed waste, fraud, and corruption in Federal Government wartime contracts. Nazi Germany surrendered a few weeks after Truman assumed the presidency, but the war with Imperial Japan raged on and was expected to last at least another year. Truman approved the use of atomic weapons to end the fighting and to spare the thousands of American and Japanese lives that would inevitably be lost in the planned invasion of Japan and Japanese-held islands in the Pacific. This decision remains controversial, even though it forced Japan's immediate and unconditional surrender. Truman's presidency was a turning point in foreign affairs, as the United States engaged in an internationalist foreign policy and renounced isolationism. Truman helped found the United Nations in 1945, issued the Truman Doctrine in 1947 to contain Communism, and got the $13 billion Marshall Plan enacted to rebuild Western Europe. The Soviet Union, a wartime ally, became a peacetime enemy in the Cold War. Truman oversaw the Berlin Airlift of 1948 and the creation of NATO in 1949. He was unable to stop Communists from taking over China. When communist North Korea invaded South Korea in 1950, he sent in U.S. troops and gained UN approval for the Korean War. After initial successes in Korea, however, the UN forces were thrown back by Chinese intervention, and the conflict was stalemated throughout the final years of Truman's presidency.